SaraS was designed for the Socrates Museum Gallery for a one day viewing on October 22, 1989 from 2pm to sunset. My vision of this "site-specific" work was to integrate the dynamics of daylight and laser light to actively define and modify the indoor environment. Following is a viewer's experience of the installation: "The building is entered from midafternoon daylight. A staircase lit with yellow monochrome light begins to saturate color vision. The absence of color creates an after image of complementary blue hue. A "conditioning" is affected into the interior space. The viewer ascends to the second floor doorway and enters a room containing an atmospheric blue-violet light. Overhead, a dynamic perspective opens into view. 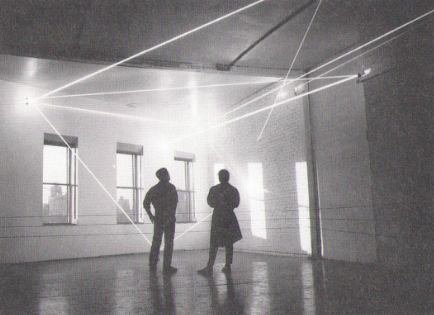 Hovering above and criss-crossing through the volume of gallery space is a 40 foot long laser beam construction. Its intense yellow-green color is enhanced against the background of scattered violet luminance as the eye adapts from previous color orientation. At the opposite end of the room, a row of adjacent windows frames a diffused view of sky, city, water, and landscape. The glass of the windows is tinted, though appears "white" in relation to color in the room. Three distinct red-violet solar patterns cast down from the windows and slowly arc up across the floor onto the adjacent wall. 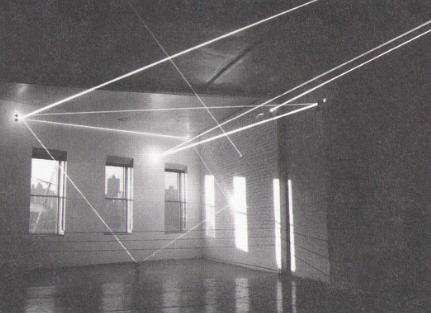 The laser sculpture's composition of beams hinges on this movement. Active areas of line, color, and form appear along different viewpoints. As the sun nears the horizon it aligns directly with the windows and frames three parallel rectangles along the adjacent wall. Here they end their transit radiating a bright pink chrome, and then slowly fade." Special thanks to Sarah, Trix and Curt and the clear, purple sunset that followed a week of rain.